Case Study: A Soggy Slope | Masseo Landscape Inc. 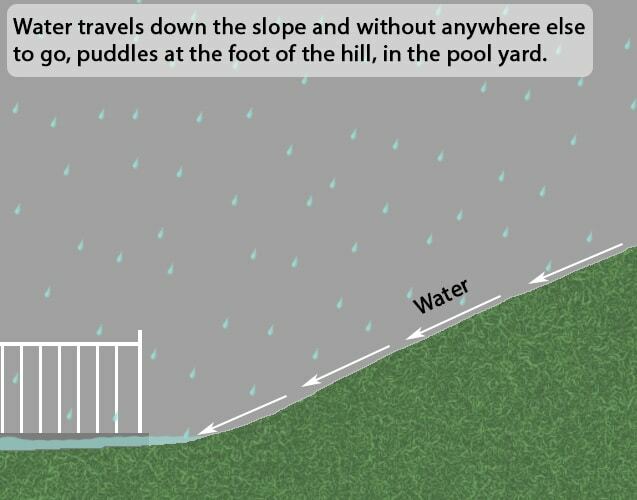 Slopes can give your landscape definition and variety, but they come with their own set of pitfalls. 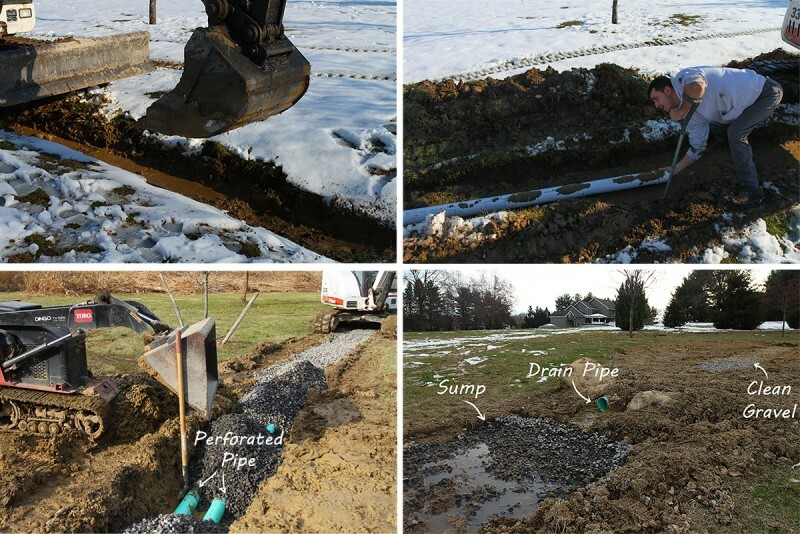 The most common issues we see relate to drainage, as was the case with this client from Highland, NY. Their pool yard sat directly at the foot of the hill in their backyard. During storms and wet periods, precipitation from the hill would pool on the concrete or worse, in the landscape beds. The property owners had previously created a swale to accommodate the excess water, but it just wasn’t doing the job. With that in mind, we decided to upgrade the landscape by installing a French drain. 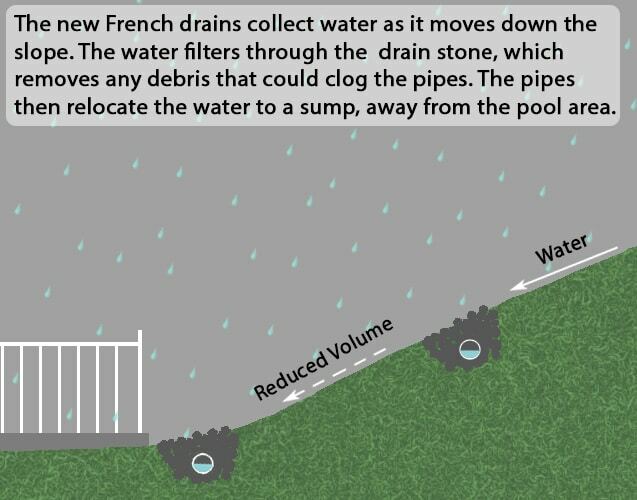 A French drain consists of a perforated pipe installed into a trench filled with clean gravel. As demonstrated above, the gravel filters out debris that could clog the drain, meaning they’re low maintenance and effective. Drains like this usually “day-light” (end) in sump, a depressed area of the landscape where water can drain out. However, they can also be tied into other drainage systems or outflow into a catch basin or other retention structure. To solve this particular issue, we actually installed two drains that would work in tandem, one at the top of the hill, and another midway down. We started the project in December, so we used our mini-excavator to dig trenches into the frozen ground. The deeper the trench, the more effective the drain will be. After that, we installed our piping and backfilled the area with clean crushed stone. With the drains in place, most of the water that previously would have rolled down the hill into the pool yard is caught by the drain, which relocates the water to a sump on the other side of the property. The result? No more soggy flower beds! French drains are a landscape staple for a few very good reasons. They’re quick and easy to install. Depending on the length and how deep the trench, French drains can be installed in the span of a couple day. The excavation needed to build one is minimal, and they don’t disturb the surrounding areas. They’re easy to repair. Broken pipe? While this may be inconvenient, if it does happen, replacing or repairing is a matter of locating the issue and removing the gravel on top to repair.